Based on the novel "All You Need Is Kill"
...Liman's elaborately choreographed tracking shots and unglamorously visualized European hellscapes evoke 'Children of Men,' the creatures themselves have a touch of the Sentinels from the 'Matrix' films, and the monsters-vs.-infantry scenes will remind you of James Cameron's 'Aliens' and its literary predecessor 'Starship Troopers.'" 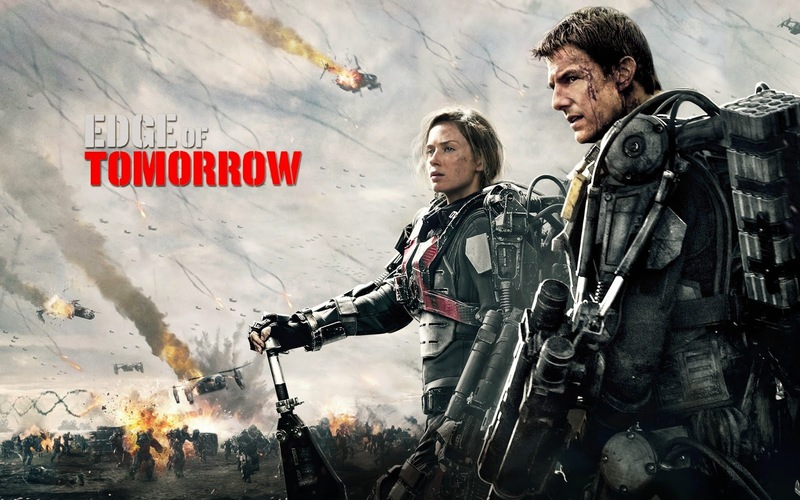 It's based on the Japanese novel "All You Need Is Kill." The story revolves around Major William Cage (in the book his name is Keiji, note the similar sounding names). At first Cage is just an ad man. He does the media portion of the work for the military, but when they decide they need every able bodied man to do their part on the front line, he finds himself demoted and most certainly out of his element. The irony here is that Tom Cruise, known for his action hero persona, is playing against type in the early scenes. However he's very convincing as a sniveling little coward who, despite his attempt at blackmail, can't quite weasel his way out of serving his time. The problem I had with the beginning is that it just doesn't make sense for the military to force a man who has had essentially no training whatsoever to be suited up and sent to the front lines. They have one whole day before the attack. There is very clearly a training center on the base he's sent to, but instead of allowing him to at least spend the one day training, he's sent to the front lines cold, where everyone knows he'll die. All the military men seem dead-set on getting this man killed. It would seem a random waste of life and what is likely expensive military equipment. He is a liability to his squad mates who don't even trust him enough to tell him how to turn off the safety on his weapon. The next scene where the troops fly in and drop on the beach is very reminiscent of WWII films showing the horrors of attacking the beaches of Normandy. During the battle, Cage sets off an explosive that kills an Alpha Mimic, splattering its blood all over his face. The blood is acidic and gruesomely melts through Cage's face. After dying, he wakes up back in time to where he first arrived and thus begins the Groundhog Day-like repetition of time. Just like Bill Murray's Phil Conners, Cage learns through repetition and is able to alter the day through practice. However, unlike Phil, who's day resets at 6 AM every morning, Cage could live several days, because time only resets after he dies. However, considering the imminent attack of the mimics, it's unlikely he'll make it more than a day or two. It's discovered that this manipulation of time is not a random occurrence, but the power of the Mimics. They can relive any day over and over again, if need be, in order to never lose a battle. When Cage killed the alpha and had it's blood land on him, this power was transferred to him. It turns out Rita (Emily Blunt) has had this power before (note that Rita is the name of the female love interest in Groundhog Day as well). She lost the power by being injured but not dying, after receiving a blood transfusion. She and a crazy scientist friend of hers (Noah Taylor) figure out that the creatures are a hive mind. They need to find the central core and destroy it. That means the whole thing is another one of those sad cure-alls that has become a bit of a cliche in films like this by now. Cut off the head of the snake and the rest of the body dies. That's been done way too many times. Nevertheless, getting there and figuring out the details is why we watch the film, and they certainly have their fun getting there. Despite the more serious nature of the film, they take a page from Groundhog Day's playbook using the repetition as a chance for comedy. We watch while Rita trains Cage day after day, until he's injured and in need of "resetting." They test out different tactics on the battlefield until they get things just right, or decide that it won't work. Failing just means they'll die and the day will reset. However, we grow too accustomed to the idea that Cage is never truly in danger. Death is no problem for him. As a result, the mimics are never as scary as they're supposed to be. When, later in the film, Cage loses the power the way Rita lost it, it's a missed opportunity that they didn't try to bring in some horror elements and allow the audience to fear the creatures. As the film winds down, it feels as though they've needlessly tacked on a happy ending and a needless romance that adds nothing. Groundhog Day's romance was nice, it was at the center of the film, but here it's not really all that believable. Thankfully it also doesn't go too far, so it's a minor complaint. The tacked on happy ending, however, does feel a bit much. It's hard to wrap your head around the idea that they could destroy the alien creatures and the day would still somehow reset, but at a different point (how is the starting point of the day determined?) and the thing they were fighting in the first place is nonexistent, but each of them is still serving the roles they were initially. Instead of a bittersweet sacrificial ending that makes sense, we're given a happy but confusing ending that is a little hard to make sense of. I guess we are still waiting for Hollywood to stop patronizing us, or is that just a weakness of the original source material? Either way the overly happy, and slightly unbelievable ending was unnecessary. So will it hold up and be as fondly remembered as Groundhog day? Not even close, but then again it doesn't have a holiday associated with it to give networks a good reason to show it, or families to pull out their DVD copy at least once a year either. However, I don't want to make it sound all bad. It is entertaining, and it certainly has its moments. The scene where Cage first hits the beach and everyone is attacked by the mimics is pretty intense, and the repeated attempts to figure out a way through the battle are quite entertaining as well. 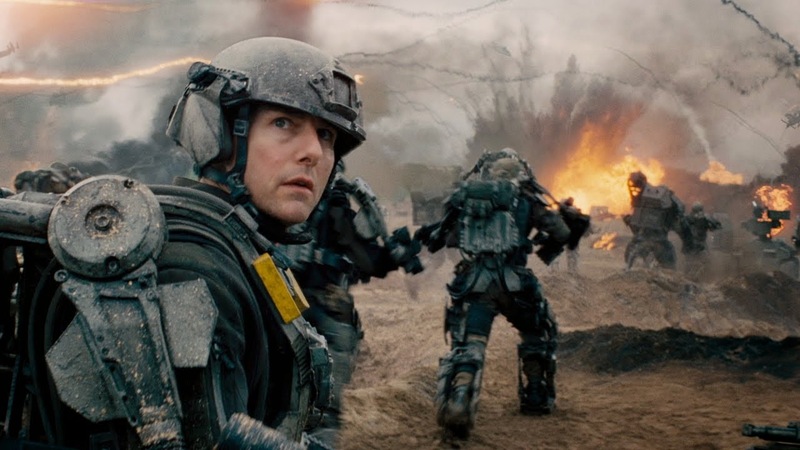 Tom Cruise is excellent both as the sniveling coward in the beginning and a veteran soldier by film's end. If you haven't seen it and you're reading this, it is worth seeing at least once if the trailers had you at all interested.